TNX futures are in focus this morning as yields creep ever higher. The overnight high was 29.44, and while the 150% Fib level is at 29.66. Since then it has pulled back, but there does not seem to be an end to higher rates, yet. There may possibly be one more probe higher to the top. 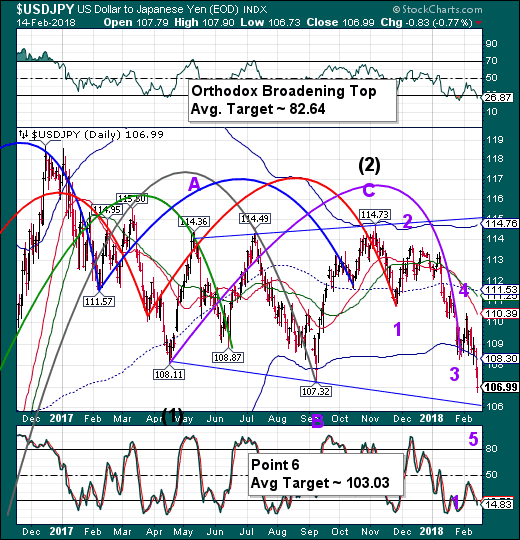 Possible targets range from 30.18 to 31.36. As Northman Trader pointed out yesterday, there is a Cup with Handle formation with the Lip at 27.00 that suggests a probable target for Wave 5 near 37.00. 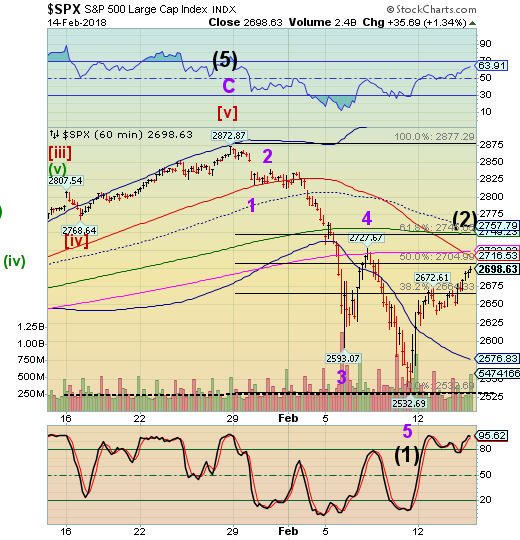 However, the Cycles Model suggests a probable retracement to the neckline may occur first. ZeroHedge comments, “Global stocks, bond yields and commodities all jumped higher on Thursday while the dollar plunge continued, as investors suddenly seemed to forget the inflation fears blamed for a brutal market sell-off in recent weeks. SPX futures probed to the 50-day Moving Average at 2722.00 in the overnight session before pulling back closer to the 50% retracement level at 2705.00. 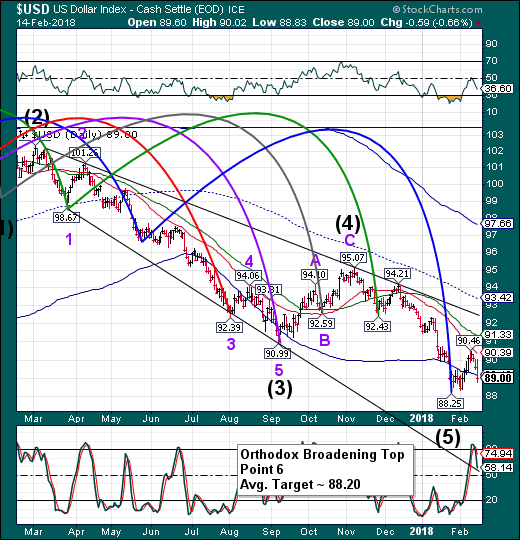 The retracement appears to be nearly complete, so we must stay on the alert for a reversal. It is difficult to say whether there is a large institutional interest in the long side of the market going into opex. Rising rates may have an impact on how much further this retracement has to go. A market failure going into opex will have a dramatic effect on the size and intensity of the decline. Bloomberg reports, “The global stock rally marched ahead as investors took in stride a jump in benchmark Treasury yields toward 3 percent. The dollar fell for a fifth day, while the the yen and crude oil advanced. VIX futures are lower this morning, as they fall beneath the Cycle Top support at 19.41. I have rearranged the EW structure a bit to reflect the size of the decline. In addition, I have also modified the degree so that the top (50.30) of the Cycle may have become Cycle Wave 1 or A. 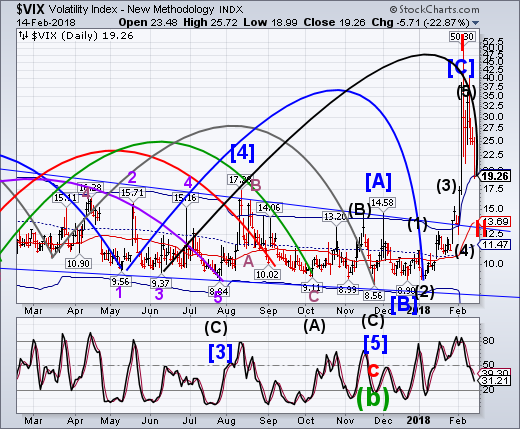 The reason why is that the VIX usually makes its Cycle high at the bottom of SPX Wave . That may only make room for one more surge higher. The alternate is that what we see may be Wave I of a five wave Ending Diagonal to the upside. USD futures have declined to a low of 88.49, which is getting dangerously close to the previous bottom. This may end up being either Wave 5 of (5) or an expanded Wave B. Again, there seems to be no end, but there may be a Trading Cycle low due this weekend that would fit the bill. Even if the USD reverses its course, USD/JPY appears to be headed for Point 6 of its Orthodox Broadening Top formation at 103.30. Wave 5 has reached equality with Wave 1, but it appears that it may expand even further. 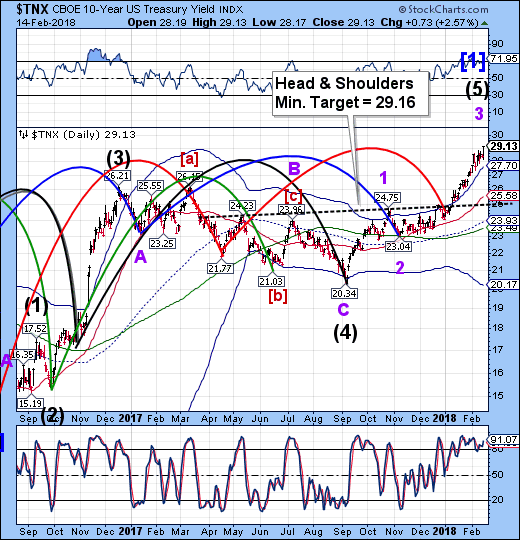 Wave 5 may need to be double the size of Wave 1 in order to hit its target. This may suddenly drain what little liquidity is left in the markets, IMO.